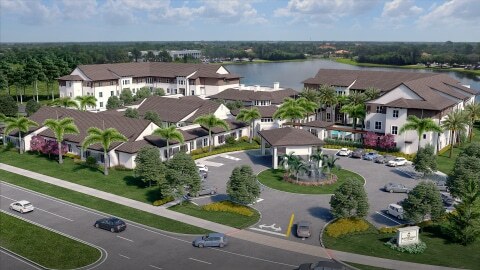 Watercrest Senior Living Group announces the development of Watercrest of St. Lucie West Assisted Living and Memory Care Community in the rapidly expanding city of Port St. Lucie, Florida. The 128 unit senior living community, architected by D2 Architecture, will open in the fall of 2017 featuring resort-style service, extraordinary care and luxurious residences with breathtaking lakeside views. Watercrest principals, Marc Vorkapich, CEO and Joan Williams, CFO, are setting new standards of quality for seniors and their families in the development of upscale senior living communities. Watercrest of St. Lucie West is a signature Watercrest product, offering 102 assisted living and 26 memory care apartments with premium accommodations, stunning design and picturesque water views. Residents will enjoy pampering in elegant Spa W, savor private label Watercrest wines at the wine bistro, and relish the flavors of locally grown, seasonal ingredients and organic fare whether dining waterfront, bistro-style or in the chef’s private dining room. Walker & Company has begun preliminary construction of the 112,000 square foot building located at 279 NW California Boulevard. Upon completion, Watercrest of St. Lucie West will include a stunning promenade, fireplace, signature water wall, multiple dining options, pool, salon & spa, grand balconies and Florida style outdoor living spaces with tranquil water views. Ideally situated in Port St. Lucie, the surrounding area offers attractive waterways, recreational facilities, a top-rated park system, a growing arts and performance community, retail centers, entertainment venues and vast residential options. Watercrest Senior Living prides itself on providing outstanding caregivers and extraordinary care, all tailored to individual resident preferences. Their comprehensive memory care program is specifically designed to engage the senses, expand the mind, and enhance the emotions of residents. All Watercrest memory care associates are Certified Dementia Specialists and programming focuses on innovative lifestyle approaches, including personal life silhouettes, multi-sensory enhancements, Memories in the Making, and Music and Memory programs. Watercrest Senior Living Group specializes in the development and operations of assisted living and memory care communities, market repositioning and advisory services. Partnering with a wide variety of stakeholders such as land owners, real estate developers, investors, financial institutions, and REITs, Watercrest Senior Living Group focuses on its core strengths, operations management of assisted living and memory care communities and the development of servant leaders.